Nowadays you get to see different varieties of clocks. 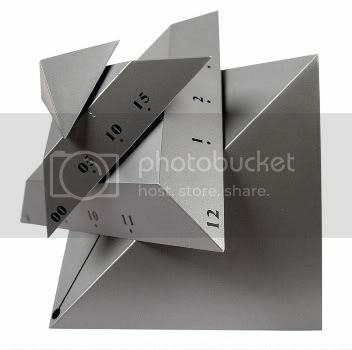 Here’s a great one- Time cube clock. It gets its name from its cube shape. 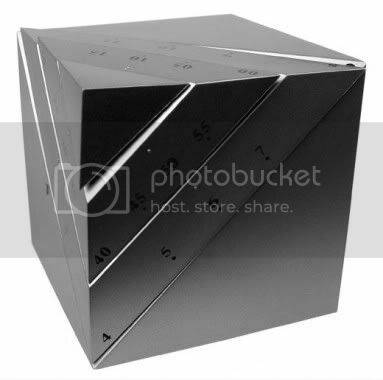 Instead of conventional hands, at the corner of the cube there are three triangular layers which represent the second’s hand, minute hand and the hour hand. As time ticks away the clock no longer remains in the form of a cube as the triangular layers move. It’s a 12 hour AM/PM clock face and is powered by 1 AA battery. This clock is really unique I would certainly love to keep one in my room. It’s priced at about $12 which is pretty fine. If you liked it you can get one from here. 20q- The Gadget That Reads Your Mind!